Want your grocery shopping done for you? Who doesn’t!? We reviewed the top 8 grocery delivery services to give you the low-down on how each works, costs and coupon options. Instacart and a plethora of other options exist for grocery delivery... are you using them? In today’s modern world, it’s only natural that our grocery shopping has turned to technology. There are many online grocery delivery services that make our fast-paced lives a little easier, offering a quick and convenient way to get our most-needed items. Find our top eight picks below and see if you’re ready to give up the “old-fashioned” ways of grocery shopping. 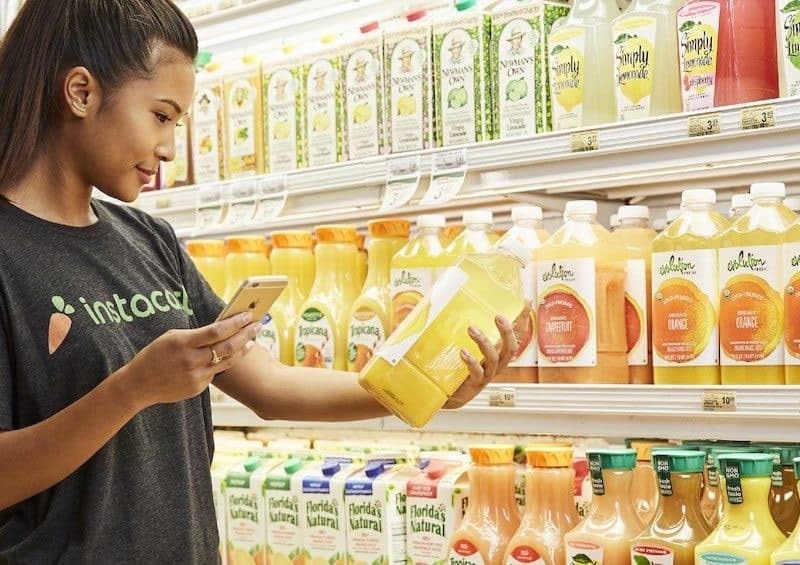 How it Works: Instacart delivers right to your door from select stores in your area, including grocery stores, pet stores, pharmacies and even liquor stores. The service is available in 40 states as well as Washington D.C. All orders must be a minimum of $10. Receive your order in as little as one hour. What it Costs: Each retailer sets its own pricing on items. The convenience of Instacart means many retailers set their online prices higher than in-store prices. Delivery fees range depending on the amount of items and chosen delivery time. There is a “Busy Pricing” delivery fee for high-demand delivery times. Instacart also charges a 5% service fee. For $99 a year or $9.99 a month, you can become an Instacart Express member and avoid those delivery fees on all orders over $35. Plus, you won’t be charged a “Busy Pricing” delivery fee or a service fee. Coupons: Instacart does not accept in-store or manufacturers’ coupons, but does have its own savings and coupons that automatically apply to qualifying products at checkout. How it Works: Peapod has its own warehouses with brand-name and self-brand grocery store items ready to be delivered to your home. The service is available in 12 northeastern states and Washington D.C. Get your delivery as soon as the next day, or schedule your delivery for up to two weeks in advance. What it Costs: Delivery fees start at $6.95. Peapod offers a 60-day “free trial” with no delivery fee. With Peapod’s PodPass membership, you get free delivery on orders over $100. This costs about $120 for the year. Coupons: Peapod accepts manufacturers’ coupons and actually doubles them up to $.99. They also offer their own sale specials just like a regular grocery store, as well as discounts on delivery fees for groceries delivered during the week. How it Works: Shipt brings you groceries from a variety of supermarkets in your area, and also deliveries liquor in select locations. You can connect with your personal shopper via text as he or she gets your order together. The service is available in 45 states. Receive your delivery in as little as one hour. What it Costs: A membership is necessary to use Shipt, which costs $99 a year or $14 a month. Delivery is free for orders over $35. A $7 delivery fee applies for orders under $35 and some liquor orders. In general, Shipt’s prices are slightly higher than in-store prices. A small service fee may apply for select retailers. Coupons: Shipt does not accept manufacturers’ coupons, but does offer its own sales on items. How it Works: Amazon’s delivery service offers popular brand-name items available for same-day delivery, whether you’re home or not. Service is available in major U.S. markets like Seattle, San Francisco, Dallas, Miami, New York and more. What it Costs: Only Amazon Prime members are eligible for AmazonFresh’s services. Prime membership costs $119 a year or $12.99 a month. On top of that, AmazonFresh costs $14.99 a month. Orders over $50 ship free, while orders under $50 have a $9.99 delivery fee. Coupons: AmazonFresh does not accept manufacturers’ coupons, but offers its own deals and coupons on items. How it Works: The items Brandless offers are just that… brand-less. While you won’t find popular brands on this site, that doesn’t mean the quality is compromised. Brandless offers high-quality, organic, non-GMO products in all categories – food, household, personal care and more. Brandless boxes arrive within 3-5 business days, so obviously the company does not offer perishable foods. Brandless ships all over the U.S., with the exception of Alaska, Hawaii and P.O. boxes. When you sign up for a Brandless membership, the company donates 10 meals to those in need; after that, they donate two meals every time you shop. What it Costs: Because all of the items are “brand-less,” Brandless can offer its items at cheap prices. More specifically, every item costs just $3. Membership costs $36 a year and you get free shipping on every order. If you choose not to become a member, shipping costs $5. Coupons: With already-low prices and no-name items, Brandless does not accept any coupons. How it Works: Google Express likely offers the widest variety of items. Shop both major and minor retailers for literally anything you need. Service is available within the U.S. with delivery times ranging from same-day to one week, depending on your location and chosen store. What it Costs: Item prices are set by the retailer, and in most cases you pay the same price you’d pay in the store. If you meet the store minimum – usually $25-$35 per store – there are no service or shipping fees. If you do not meet the minimum, fees start at $4.99. No membership is required. Coupons: Google Express does accept store-specific promo codes. How it Works: With Kroger Ship, customers can shop both Kroger’s brands, called “Our Quality Brands,” as well as other brand names. Kroger Ship is available in Cincinnati, Louisville, Houston, Nashville, Virginia, West Virginia and the Raleigh-Durham area of North Carolina. Certain areas can receive items as quick as the next day. What it Costs: Orders over $35 ship for free. For orders under $35, shipping is $4.99. How it Works: Walmart’s delivery service is available to your doorstep or to your car via same-day pickup when you visit the store. Service is available in select cities in 39 states, and not all cities offer both delivery options. Same-day pickup is more widely available. What it Costs: The pickup option is free, while the fee for delivery to your doorstep varies based on your chosen delivery time. Coupons: Walmart accepts manufacturers’ coupons for both delivery options.